This study investigated the change in the energetically optimal cadence after prolonged cycling. The energetically optimal cadence (EOC) was determined in 14 experienced cyclists by pulmonary gas exchange at six different cadences (100–50 rpm at 10 rpm intervals). The determination of the EOC was repeated after a prolonged cycling exercise of 55 min duration, where cadence was fixed either at high (>95 rpm) or low (<55 rpm) pedalling rates. The EOC decreased after prolonged cycling exercise at a high as well as at a low fixed cadence (P < 0.01). According to the generalized muscle equations of Hill, this indicates that most likely more type I muscle fibres contribute to muscular power output after fatiguing cycling exercise compared to cycling in the beginning of an exercise bout. 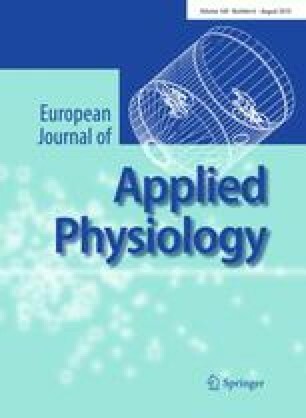 We suggest that the determination of EOC might be a potential non-invasive method to detect the qualitative changes in activated muscle fibres, which needs further investigation. We thank Dr. Ruth Briggs for commenting and revising the manuscript. The experiments comply with the current laws of Switzerland.